Welcome to Meridian Manor, one of the most efficiently managed 55+ communities in the Greater Phoenix East Valley. 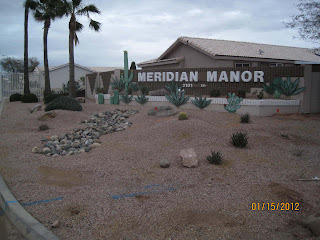 Meridian Manor is a gated, 55+ community located in Apache Junction, Pinal County, an eastern suburb of Phoenix, AZ. It is located between Meridian Road on the west, Delaware Street on the east, and just north of Southern Avenue. Owning a home in Meridian Manor is an excellent real estate investment. Current HOA fees are just $70 monthly. The low homeowner fees are due, in part, to the efforts of many hard-working, dedicated Resident Volunteers. There are 443 homes in Meridian Manor.